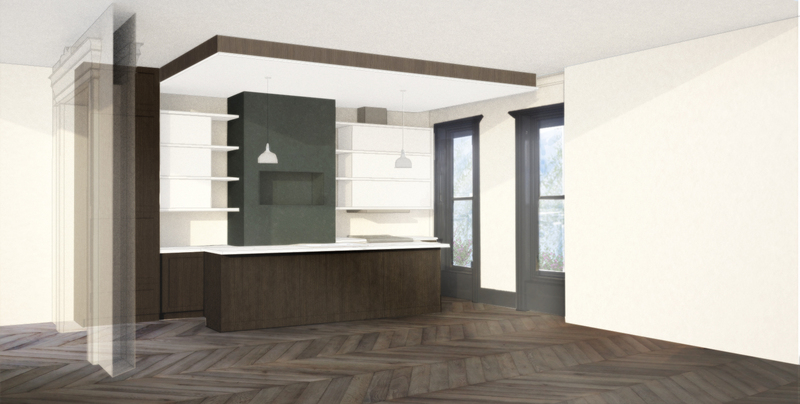 Opera-Studio Architecture is designing the renovation of a traditional Brownstone in Bedford-Stuyvesant, Brooklyn. With Urban Elephant as the general contractor (atlanticelephant.com), the renovation will restore a two-family dwelling and a renter’s unit at the basement. The design intent is to retain the character and detail of the traditional townhouse while upgrading it with new systems from the inside out. The scope of work includes leveling and replacing the floors, restoring and replacing interior woodwork, designing new interior kitchens and bathrooms, integrating new mechanical and plumbing work, replacing exterior windows and doors, restoring the exterior façade, and proposing a new exterior garden space with a parlor terrace. 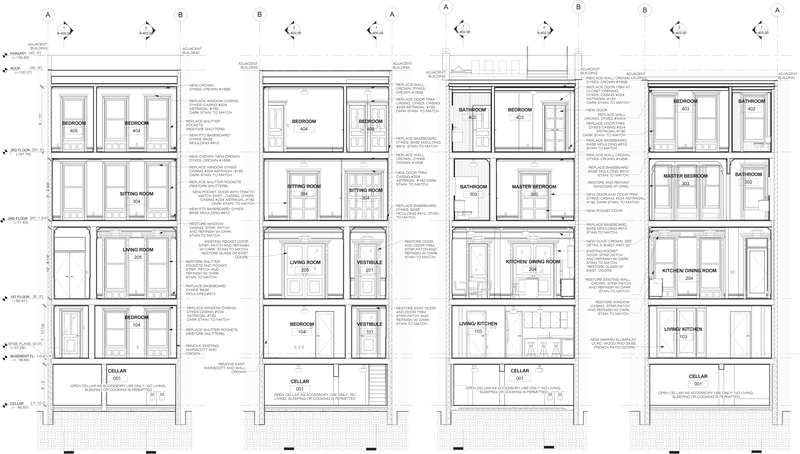 The extent of this renovation required landmarks and department of buildings (DOB) approval. 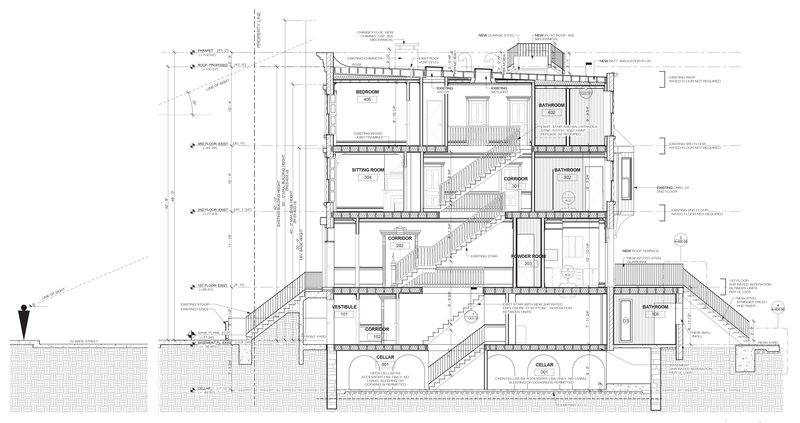 An important aspect of the design process was surveying and identifying key features to retain throughout the house. During the pre-construction and demolition phases, an evaluation of the original woodwork and ornaments was conducted, preserving all those which remained in good condition. A close inspection of the woodwork throughout the house helped us to distinguish the original woodwork from that which was added throughout the years. Ultimately, this resulted in maintaining the door trim and window casings on the parlor floor while replacing the crown molding and baseboards throughout. On the second and third floor, we completely replaced the lower grade woodwork. New trims and casing were specified from Interstate and Lakeland Lumber; and were selected in the same language as the existing original woodwork. Often the decision to maintain the original woodwork affected the scope of work. For example, the parlor floor would have normally been gutted as part of the renovation. However, in this case we refrained from leveling the parlor floor to avoid misalignment with he original wood trim. The existing wooden stair, wainscot, and balusters are an integral part of the house. W carefully restored the railing and spindles, while replacing the treads and reinforcing the stringer. The stair creates a visual connection between floors, whereas the existing fireplaces act as a centerpiece for each room. The basement bedroom, parlor level living room and third floor bedrooms maintained their original fireplaces. The original wood mantles were carefully removed and preserved while the chimney was relined using steel and fire dampers; meanwhile the fireplace was redone with new fire brick. A particular effort was made in maintaining the character of the original fireplace, which had a distinctive use of mosaic tile at the hearth and at the fireplace surround. The selected mosaic tiles from Mosaic House in New York City are reminiscent of those initially found in the house. Despite leaning towards a traditional design, this brownstone was renovated to provide modern day comfort. In meeting today’s energy and air leakage standards, we specified closed cell spray foam insulation. This, along with a new concealed ducted HVAC Futjitsu split system and radiant floor heating means this traditional brownstone will perform as a modern home. The installation of radiant flooring allowed for the removal of the traditional radiators which despite offering the appeal of a traditional home, are not very energy efficient. This also allowed for freeing up the interior space, giving the future tenant more variety in furniture and interior layouts. The integration of these new systems: radiant floors, concealed ducted AC, and new plumbing, was no easy task. As with most traditional Brownstones built prior to the era of NYC sewer systems, there is no coherent location to run mechanical and plumbing risers. Furthermore, the existing plumbing was carved out of the party wall undermining the structural stability of the rear façade. Furring out the party wall allowed for the existing plumbing to be relocated. In addition, it provided space for the new kitchen plumbing work to be installed. The use of soffits and woodwork allowed for discreet placement of the AC units throughout the house. The Kitchens are a moment of new design expression. Despite the contemporary look of the clean linear shelves and cabinets, they still match the traditional feel of the house by maintaining a similar tone in wood to that of all the original trim and casings. The parlor floor kitchen has base cabinets reminiscent of the commonly found wainscot, while incorporating very simple flush inset cabinets with a linear cabinet pull. On the Basement level, the renter’s kitchen is designed with dark stained white oak paneling that weaves in and out, acting as both part of the entrance threshold and kitchen backsplash. The white lacquer cabinets bring back a modern and clean look to the space.